The Red Sox have a tough task ahead of them tonight when they face Justin Verlander in Detroit in a pivotal game 3 that could decide control of the series. Not to worry, though. 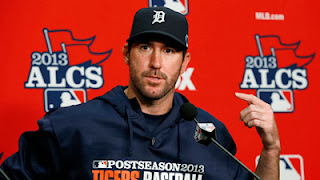 Justin Verlander is beatable and I'll tell you how they can do it. 1.) Be patient early and lower the boom later: This is first because it is probably the most important. The Red Sox need to work his pitch count early and wear him down, then lower the boom later in the game. Easier said then done, though. Verlander does not give in easily and he'll be a tough cookie to crack, but if the Sox can get his pitch count early, I see two possible scenarios playing out. 1 - Verlander does wear down and we score a few runs off of him or 2 - Verlander's pitch count get so high that the Detroit Tigers have to go to the bullpen earlier than they want and the Red Sox take advantage. Or a combination of the two will happen. 2.) Don't be statues like the majority of the first 2 games: Being statues is what led to us getting blown away for the better part of 2 games and it's not likely to get any easier with Verlander on the hill. Yes, it's important to be patient, but that doesn't mean being statues at the plate. Justin Verlander will be sure to pound the zone and we need to hit good pitches when they come. Not being statues also means fouling off pitches with 2 strikes. One of the most basic things you learn in little league is "If it's close with 2 strikes, you can't watch it." Well, the Red Sox have been letting too many close pitches go by with 2 strikes and that's why the Sox have been striking out so much in the first 2 games. 3.) Take advantage of opportunities: That was something that was missing until the 6th inning of game 2 when they finally put a run on the board. They need to do that against Verlander, because we won't get many chances to put runs up against Verlander.So, when chances come, the Red Sox HAVE TO take advantage. Simple as that. Those are my 3 keys against Verlander. Let me know what you think on Twitter (@ConorJF1016) or leave a comment.